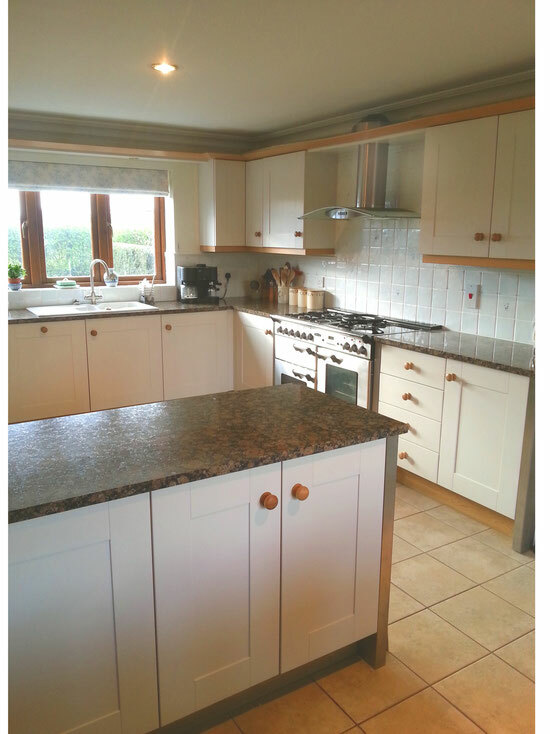 REPAINTING YOUR KITCHEN - Website of foalyardkitchens! 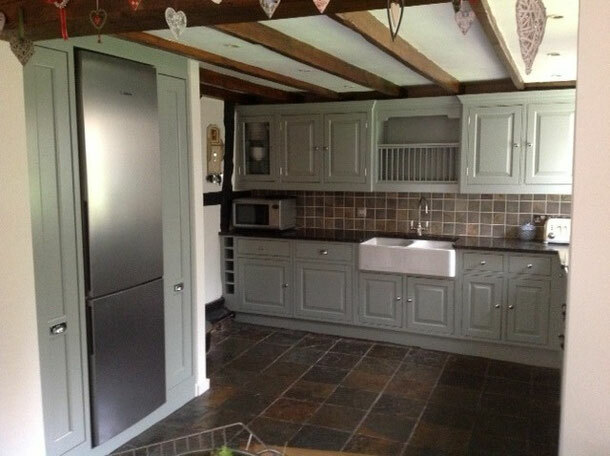 WHY HAVE A REPAINTED KITCHEN? Doors and drawer fronts are hand sanded, old door knob and handle holes are filled and re-drilled if required. Primed with the appropriate shellac, oil, or water-based primer. And re-coated with primer for a second time. And the first coat of top-coat is applied, and then sanded. The second coat of top-coat is applied - this process is repeated a third time if neccessary. And then they are packed and ready for return. Existing walls and floor surfaces are masked off, and the carcases are sanded. We use vacuum sanders to reduce any dust to a minimum. The carcases receive the same careful treatment as the doors and drawers do in our workshops. Hinges and catches are re-fitted and the doors are re-hung. The colour matching for the cabinets was done after the wall colour was chosen. This was Farrow & Ball Wimbourne White Estate Emulsion No 239. The existing steel bar handles were replaced with hand-turned oak knobs. The new knobs positioned drilled and the old holes from the previous handles were filled before the doors were repainted. The colour matching for the cabinets was achieved using the Natural Colour System (NCS) developed by the Scandinavian Colour Institute and a little bit of scanning using the Dulux "Eye for Colour" system in store at the Dulux Colour Centre - thank you Matt ! Both hinges and handles were replaced, the knobes with classic bright chrome plated knobs to match the existing matt steel hinges and the old brass hinges with matching chrome plated ones. 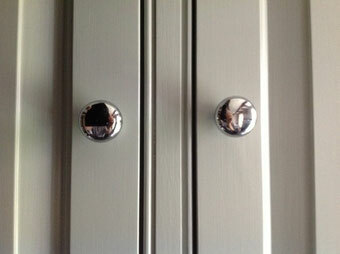 matt nickel knobs to match the existing matt steel hinges.